Ethiopia has it's own ancient calender and time. It's desperately confusing to figure out the time and date is. For example, someone might say, "We'll start at 1 o'clock and end at 8 o'clock." But the 1 o'clock is Ethiopian time so really it means 7 am and the 8 o'clock is just regular 8 am. Also computers are sometimes set to Ethiopian time and date. Sometimes the date is wrong so that they can use pirated anti-virus software. Other times the date is wrong because the CMOS battery died and it resets on bootup. Anyway, the result is that you can't check gmail because the SSL certificates are from the future. Basically, what I'm trying to say is that it's as confusing as pants. 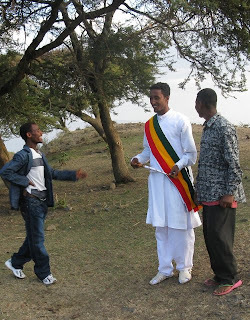 Ethiopia also has it's own ancient branch of Christianity. It was the day before Easter 2000 when I reached Dejen. For the fifty days leading up to Easter, Ethiopian Christians don't eat meat. I also didn't eat meat because it wasn't available. One butcher used the down time to repaint his shop. Then on Easter everyone has a feast. Cattlemen from three hundred kilometres away drive their herds to Addis Ababa. I have never seen such happy butchers as in Dejen that day. For myself, I hung out with a guy called Henok just shooting the breeze. At one point I was just joking and I said he should join me. But instead of laughing, he said it was a great idea. "So uh... What about your job you were telling me about?" Turns out that I had misunderstood, he didn't have a job currently. "But you were going to school though. You can't leave that." No no. School was out for two months. In the end, I decided it would be pretty cool to have company so I agreed to buy Henok a bike and let him come with me. It was sort of risky thing, because he could have robbed me blind but he seemed like a nice enough bloke and I felt I could trust him. We were discussing toilettes yesterday. My feeling is that Ethiopia has some of the worst toilettes ever. In Egypt, guys are supposed to squat to pee because peeing standing up is considered unhygienic under Islam. Also since Egyptians often wear robes, you can pee more modestly squatting. In Ethiopia on the other hand, guys consider it unhygienic to step in pee, so they stand just outside the bathroom door and aim from a distance. The good news for me was that in Ethiopia you can buy the same Egyptian brand of tissue paper. It comes in a pack of 10 tissues. I carried one in my pocket at all times. Other people cannot afford tissue paper though so a lot of newspaper and leaves are used. Newspaper would clog up the toilette so you have to throw it in the garbage afterwards. If a garbage bin isn't provided, then you can just toss it on the floor. I tried to explain to that tissue paper was OK to throw down the loo because it was designed to not clock things up, but everyone was doubtful. Also if there is a garbage can brim full of used newspaper, you may as well throw your tissue in too. Some places are maybe too remote for a daily news paper and maybe they're inside a courtyard so no leaves are available. In that situation the hotel owners are supposed to leave some water so people can clean up. Some hotel owners are lazy. You can tell which ones are the lazest by the number of poo smears on the wall. Basically everyone has the same amount of poo on their fingers and everyone shares a common desire of not crossing with another smear as you wipe your hand on the wall. It sort of creates a pattern. So all across the toilettes of Ethiopia you find the same disgusting finger painted mural of prairie grasses waving in a cool Autumn breeze.